BLUFFTON, SC -- One thing's for sure, when you come to Hilton Head Island, you'll notice the topographical variation -- or lack of it. Hilton Head's flatter than the panhandle 'o Texas. At the same time, you certainly wouldn't expect a great deal of undulation from a South Carolina coastal island -- after all, it's not exactly a volcanic inspired quadrant of Tahitian earth, and there aren't any drop-offs to rival the Glacial Sounds in Alaska. That's okay, because in a way, it's comforting to know you won't need to pack hiking ropes, a hum-vee and an ice pick to get around -- though a little variation in the landscape doesn't hurt when you're talking about playing golf. 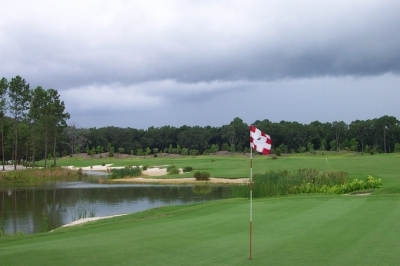 So it's nice to know there's a course just off the island in Bluffton that'll provide all the undulation you'll need to satisfy your golfing urges to hike around. And while you won't find any 80 foot falls like you'd see on a mountain course, you will face some uphill and downhill shots -- many more than you'd expect from a low country layout in this part of the world. 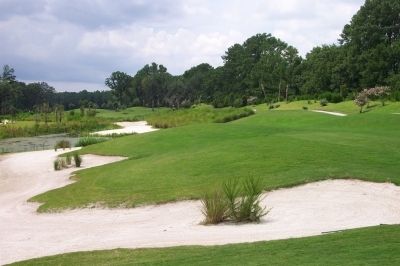 Further, Crescent Pointe, one of greater Hilton Head Island's newest courses, is an Arnold Palmer design featuring all that comes with the King's course architectural reputation. Having played some excellent Arnie scribed tracks in recent months, I've come to expect a few things from a Palmer design -- first of which is quality. Second, variety. Third, playability. And fourth, challenge -- depending on how many of Palmer's thoughtful hazards you'd like to take on (based on tee box selections). Choice is a good thing, in most respects -- and Arnie will give it to you in plenty. One other aspect sets Crescent Pointe apart from other courses in the region -- beach bunkers. Brent Carlson, Crescent Pointe's head golf professional, explains why they were put in: "The beach bunkers really help us with drainage on our course, because they run right down to the water. It used to be if we'd get a heavy rain--the rainwater would run right through our bunkers to reach the lakes or ponds. Because of it, the sand kept washing out -- so the Palmer group recommended putting in the beach bunkers. It's a nice look and works very functionally, but try hitting your ball with one foot in the water!" Luckily, I never 'got' the chance to try it -- but I can understand the point. The beach bunkers come into play on the holes with the biggest lakes -- and true to Carlson's beliefs, they do look nice. Just be prepared to take your shoes off if you're in one -- might be safer to bring a towel, a cooler and an umbrella instead. Harrison Minchew, Director of Design for Palmer Course Designs, says they also tried to do some 'traditional' things to the course to increase its aesthetic value and playability -- foremost in designing the greens. "At Crescent Pointe, we tried to make the greens a little bit more in the classic style -- with subtle contours instead of making them look like a potato chip sort of thing. We did it because some of the older, classic courses have more subtle slopes in their greens then the big bold contours that you see a lot these days. Looking at the final result, I think we succeeded." But first and foremost, the Palmer group seeks variety in the layout. 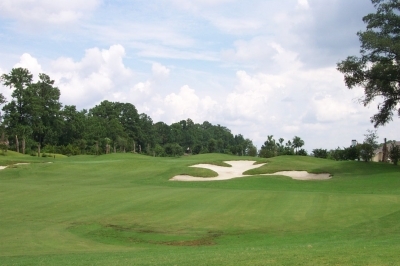 Ed Seay, Arnie's long-time design partner says that Crescent Pointe rates high in this category -- " Crescent Pointe's really a different golf course -- there isn't one hole on that layout that even comes close to looking like another." That's pretty remarkable, considering the overall quality and continuity of the golf holes. There really is something different about each hole -- a shot for every club in the bag, and a hole for everyone to have their shining moment. If you draw off the tee, there's the first hole. If you fade, there's the sixth, and so on. H2O's a big theme on this course--you get the picture. Water or wetlands, in varying degrees, come into play on every hole. But it is possible to block it out, as Carlson points out, "You can play those holes and not even notice the water, if you play it smart. There are definitely some big landing areas out there, which makes it easy to steer clear of trouble if you know how to avoid it." Luckily, hole number one wasn't one of them. Palmer starts you out with a 377 yard, slight dogleg left, with quite a wide fairway out to the right and some bunker trouble left. As Carlson alluded to, there's water short and left of the green -- and also to the extreme right. You're fortunate to go into it with a short iron -- accuracy's the name. The second is one of several potential signature holes, and does the best to embody the overall Palmer philosophy of 'if you've got water, use it.' Well, there's plenty of water, and it's used in a way where there's a full water carry to an extremely long but somewhat narrow green that dares you to shoot at the pin. It plays 211 yards at its longest -- but there is generous bail out room to the left -- you'll just leave a tough up and down to a green sloping towards the water if you choose to chicken out. Three's the first of four excellent par fives at Crescent Pointe -- just 508 yards from the back, but plays uphill on the approach. Carlson says all four of the par fives are reachable if played correctly -- but on this one (as is true of the others, too), you'll need to avoid a plethora of trouble along the way -- carrying a bunker, wetlands and avoiding water to the right of the green. Tougher than it sounds. Six is the second par five with an exceptionally generous tee shot landing area. Carlson says it must be as wide as a football field -- just hit it between the hash marks and you'll be okay. The interesting part comes on the approach -- to an island green. Even for a blasted tee shot, you'll still have about a 200 yard carry to reach the island. Nine is one of the most visually intimidating par threes I've ever seen. 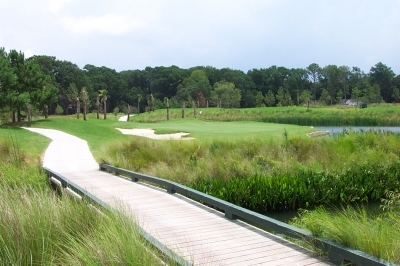 216 yards from the back, it's nearly all carry over wetlands that look like they stretch from tee box to horizon. Like most tests, once it's over, you wonder 'what was I so worried about,' as you'll notice there's quite a bit of landing area if you clear the trouble. Minchew said that nine was also quite a challenge to build. "We couldn't really bring a bulldozer or heavy tractor across the marsh, so we built that green complex by hand -- taking out the trees and filling in the dirt with nothing larger than a small farm tractor." Judging by the end result, it was well worth it. 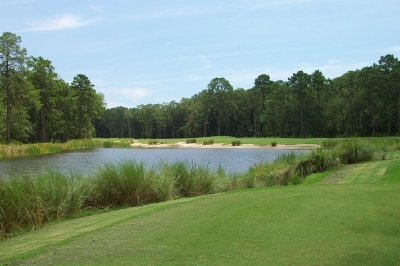 Eleven's the next great par five, a 533 yard beauty with a risk-reward water and beach bunker carry off the tee. The day we played it was into the wind, adding to the difficulty of the tee shot. Second and potential third shots will have to carry more wetlands and enough bunkers to make Saudi Arabia look like a tree-filled oasis. Well, not that bad, but the hole demands precise shot making. Thirteen's an interesting hole -- a 451 yard dogleg right that dares you to try and fade one over water and a beach bunker to shorten your approach. The more trouble you bring into play and avoid, the greater the reward. Classic theory, exceptional practice. 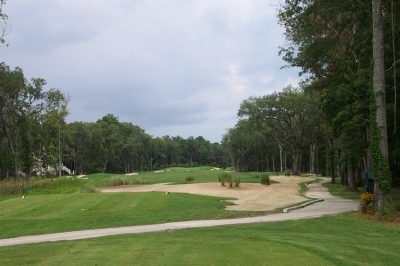 Closing it up, Crescent Pointe's a fresh new approach to golf in the Hilton Head Island region. 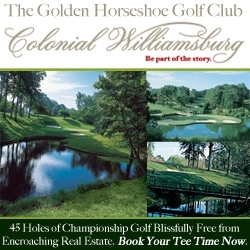 It's got the type of terrain and golf hole variety that you'll find in other notable golf destinations, along with the low country feel you'll get right here in southeast South Carolina. So don't be discouraged when you arrive at the island and see nothing but flat ground -- there's some less than level ground waiting just a bridge shot away. 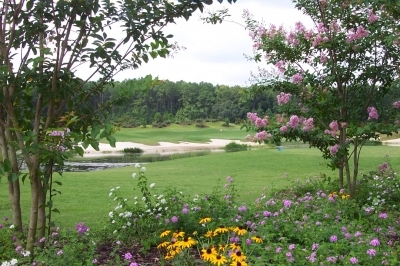 Packages available with sister course Eagle's Pointe.